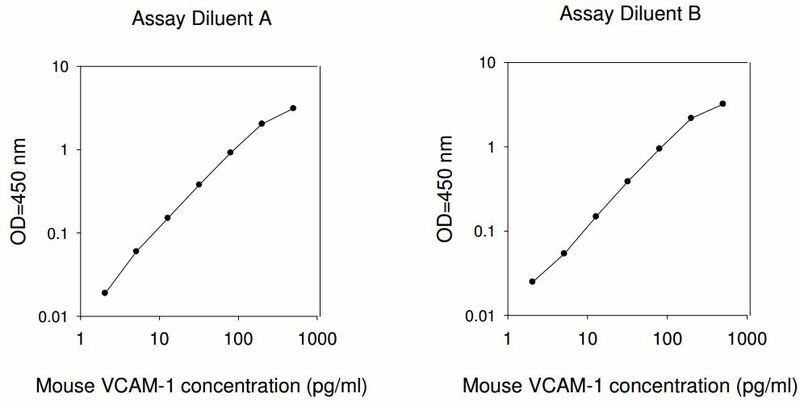 RayBio® Mouse VCAM-1 (CD106) ELISA Kit for cell culture supernatants, plasma, and serum samples. This ELISA kit shows no cross-reactivity with any of the cytokines tested: Mouse 6Ckine, CTACK, Eotaxin, GCSF, GM-CSF, IL-2, IL-3, IL-4, IL-5, IL-6, IL-9, IL-10, IL-12p40, IL-12p70, IL-13, IL-17, IFN-gamma, KC, Leptin, MCP-5, MIP-1 alpha, MIP-2, MIP-3 beta, RANTES, SCF, sTNFri, TARC, TIMP-1, TNF-alpha, TPO, VEGF. Burks S., Nguyen B., Tebebi P., et al. Pulsed focused ultrasound pretreatment improves mesenchymal stromal cell efficacy in preventing and rescuing established acute kidney injury in mice. Stem Cells. 2015 Apr;33(4):1241-53. doi: 10.1002/stem.1965.